Whatever you do and wherever you go, take a moment and feel the spirit of the Reef. 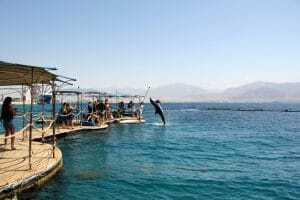 Dolphin Reef , on the shores of the Red Sea, is an ecological site unique in Israel and throughout the world where visitors can enjoy a natural atmosphere, magical views, secluded beach, together with the unusual opportunity of meeting and observing dolphins in their natural habitat. 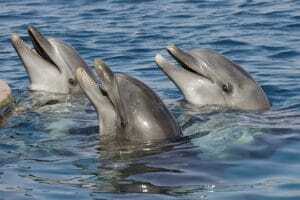 Contact with people is based on the free will and choice of the dolphins. Their choice to approach guided groups of snorkelers or divers is not based on any reinforcement by feeding during these encounters. 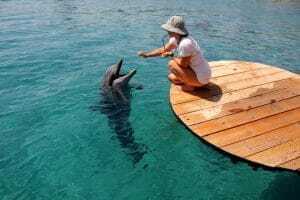 It is worth mentioning that the dolphins continually develop an even stronger connection with humans based only on curiosity, play, and spontaneous interaction. 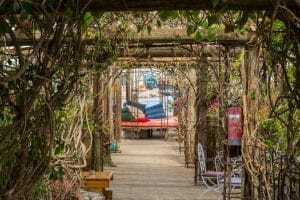 You can also enjoy other facilities at extra cost such as: snorkeling and diving center, restaurant,cafe/bar on the beach,relaxation pools,children’s activity center,underwater photography center and Souvenir Shop.